“If you suffer from severe psoriasis, you may want to consult with your rheumatologist and cardiologist” advises Dr. Jeffrey Sobell, a dermatologist and psoriasis specialist in Boston. Learn why. Psoriasis is a chronic and incurable disease affecting 3% of the US population. The red scaly lesions on the skin are striking in appearance, however the manifestations of psoriasis often go much deeper, particularly for these people with more extensive psoriasis (covering more than 10 palm-sizes). In these individuals, there is an increased likelihood of several medical conditions, including arthritis and cardiovascular disease. Psoriatic arthritis is seen in up to 30% of those with psoriasis. One or more joints can become swollen and tender, particularly the hands, knees, hips and/or back. Symptoms commonly are most severe after periods of inactivity, such as in the morning, and gradually improve after an hour of more. Unfortunately, in half of untreated patients with psoriatic arthritis, damage can lead to joint disfigurement and potential disability. Psoriasis is also associated with an increased risk of having a cardiovascular event. In fact, death occurs in those with extensive psoriasis on average five years earlier than individuals without psoriasis, mostly from heart attacks and/or strokes. Part of the risk is explained by cardiovascular risk factors, which are more commonly seen in patients with psoriasis. These include obesity, diabetes, high blood pressure, smoking and high cholesterol. These are serious concerns, but there is definitely good news here. Rheumatologists can address the signs and symptoms of psoriatic arthritis and prevent joint damage using medical treatments. 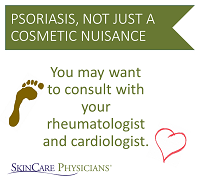 Primary care physicians and/or cardiologists can screen those with psoriasis for cardiovascular risk factors and optimize their management. Lastly, dermatologists have more therapies now than ever to control extensive psoriasis, some of which may potentially hold promise in reducing cardiovascular events as well. If you have any concerns, don’t delay and first book an appointment at our Psoriasis Treatment Center near Boston.